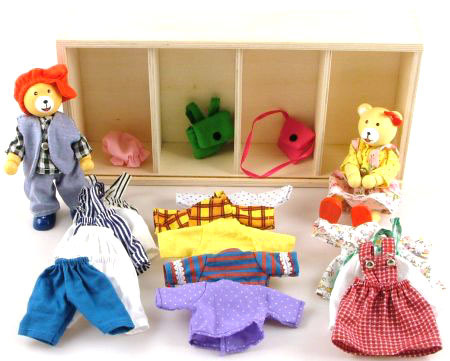 Safe in a wooden box are Mr and Mrs Bear and their 22 pieces of clothing. With lots of outfits for working , playing and going to sleep, Mr and Mrs Bear will keep your little ones fingers busy. This is a great toy and will provide hours of imaginative play. Size: Box is 27cm by 13cm by 5.5cm. Bears stand 11cm high. We like this because: "It kept our child occupied on a flight to Europe for an hour and a half. Worth it's weight in gold."